We’re home long enough for Ben to attend the Goodguys Nationals, something he does every year with his buddies. It’s a must, an absolute must for a Car Guy to shine up his wheels and show them off. This year, weather conspired to dampen the attendance of Goodguys. Friday it poured, and most of the show cars stayed under wraps. Saturday was beautiful, and Goodguys was packed with show cars, exhibitors and spectators. Sunday it rained, so most of the folks packed up and left. I used to think the reason Car Guys didn’t show cars in the rain was because they were concerned about their cars getting dirty and rain spotted. That’s partly true. The real truth of it is that most of those cars leak like sieves. When I met Ben he had a yellow ’32 Ford cabriolet roadster that had no windows and a symbolic rag top which did little to keep the weather out. Ben’s next car was a 1940 Ford that leaked from the top down and the bottom up. He spent a year plugging leaks; it still dribbled water on passengers (me) in a hard rain. His current car, a 1970 truck, also leaks. Lots of these beauties are what I call frankenrods. Depending on the age of the car, what’s under the shiny body and the leather interior is a collection of pieces and parts from other cars. The ’40 had a custom frame, Mustang axels that had been shortened, a small block Chevy engine, and retrofitted air conditioning. Every car show has a swap meet, which is my favorite part of the show. At the swap meet you can buy anything from a fully restored car to a hearse that was recovered from a barn, a bumper for an Edsel, parts and doo-dads, toolboxes–you get the picture. 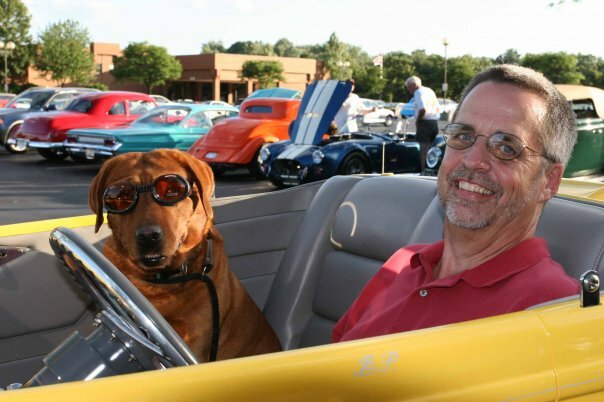 Here’s a shot of Ben and his beloved dog Flyer (Our current dog Ryder’s dad) in his equally beloved ’32 roadster at a past Goodguys show. While we’re docked at home, we’re restocking and reshuffling the motorhome. We still have empty cupboards, which if I’m to believe the blogs of others is unusual. Then again, we’re just starting out, and are still very much part timers. What I will definitely rethink is the kitchen setup. I like to cook, and I’ve always been the kind of person who will buy a whole jar of something weird of which I need one tablespoon of to make one recipe. That isn’t practical if you don’t have a lot of fridge space. I am also a shameless gadget junkie, so choosing a core set of tools has been a challenge. I mean, what if I have turnips and I need a trunip twaddler? The other thing about being home is that I must make a trip to the motorhome about 4 times a day to retrieve something I need. Hopefully I’ll remember to put it all back before we go again. I’ve also read that people buy duplicates of things to keep in their motorhomes. I’m willing to do that to a point. Perhaps as time goes on I’ll double up, but I am determined to leave this planet with less stuff rather than more. Next stop on the itinerary is Wisconsin. We start in Manitwoc for a motorhome rally. After that, we will head to Madison for yet another motorhome rally. I think it goes with the whole Car Guy vibe, the desire to drive somewhere, show off your wheels and talk about your wheels. The other benefit to these events is to stand around with guys and talk about “my problem and how I saved 500 bucks using duct tape and garbanzo bean cans.” Stay tuned; this ought to be interesting! Get yourself a gadget caddie so that way, you can move the beloved kitchen gadgets and absolute do-with-outs from the motor home back to your home kitchen. As you use each item return it, clean of course, back to the caddie, then when your packing up to go on the road….bingo, the already full caddie is just a walk away from the motor home.